Exams are always a reason to travel. Being a travel freak, I love to use every opportunity I get to travel. The exam duty at Mangalore was seen as a badly needed opportunity to travel! I really wanted a break from work, and this was the chance. The exam was on a Sunday - getting a ticket to come back was a little difficult, but I had to take some chances here, since I wanted to return early. 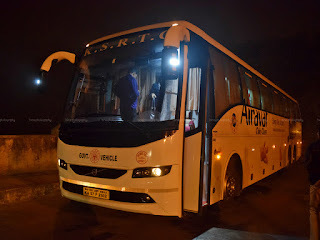 I booked my outbound in a KSRTC Airavat Club Class. I made a calculated guess, and booked the Bangalore-Manipal service hoping it would get a new Volvo B11R! I started from home around 2015hrs towards Yeshwantpur - I took a bus to Dasarahalli station, and then a Metro towards Yeshwantpur. I headed off to the nearby Hallimane restaurant for a sumptuous dinner. I ate slowly to reduce my waiting time at the pickup point, the nearby Govardhan Theatre. I still got there by 2145hrs - with more than 25 minutes to go for pick-up time. I had received a message from KSRTC already by then, and the message confirmed that I'd be traveling on a new Volvo B11R 13.8M coach. There was a steady stream of departures - the Saturday evening crowd delayed most of the buses as well. My bus, KA57-F-2502 turned up at 2240hrs - 25 minutes past scheduled time. The crew quickly checked my ticket and let me in. The interiors looked really plush and much better than the usual Volvo B9Rs. The new 13.8m Volvo B11R is a new offering from Volvo in the BS-IV series. 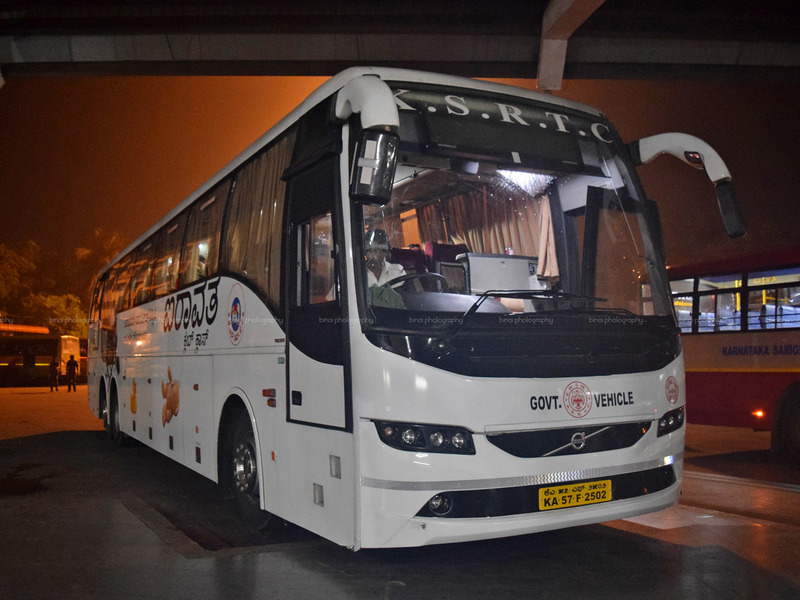 These coaches are powered by a 11-Litre 360hp engine. We started off from there at 2243hrs. The bus made quick progress past Goreguntepalya, and headed towards Jalahalli Cross. Our last pick-up was at Jalahalli Cross (2256hrs). I slowly drifted asleep as we passed the toll-gate past 8th mile. The bus was silent - really silent. The bus handled the roads really well, and we hardly felt jerks inside. I slept in no time, and had a fairly continuous sleep for quite some time. I woke up only as the bus pulled in for a break at Sakleshpura Bus station - the crew turned on the lights and announced a break before they left the bus (0243hrs). It was foggy and cold outside - I used the restroom, and then remained outside, near the bus for some time. We started from Sakleshpura at 0257hrs. I remained awake till we passed some part of the ghat - the roads were broken, but the bus really handled the craters amazingly well. Body roll was well controlled - NVH levels were well under control as well. I slept off for some more time, and woke up just as the crew called out passengers alighting at Jyothi circle - we were already inside the city! A few drops around the city, and the bus entered Mangalore bus station at 0549hrs - 49 minutes behind schedule. The bus took 7 hours and 09 minutes to cover a little over 360 kms from Govardhan (Yeshwantpur) to Mangalore Bus station! The bus after it dropped me at Mangalore.. Remarks: The bus, KA57-F-2502, of Mangalore-2 Depot had clocked a little over 47000kms. The bus was in pristine condition. The crew were really well behaved, very friendly and soft spoken. The driving style was very sleep friendly - the bus handled the ghats really well, and I could not feel the bad roads at all! I slept well through the ghats. Although the arrival was delayed, I would still rate the running time to be quite good. The bus was speed locked at 80kmph, and that perhaps did play a role in the delay. The bus had USB Mobile charges between each seat, which is a nice addition. Overall a good trip! Will I take this service again? I loved it. Will love to take it again!